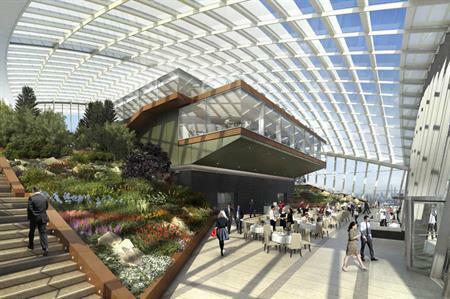 Caterer Rhubarb will launch The Sky Garden at 20 Fenchurch Street, nicknamed London's 'Walkie Talkie', for private hire in 2014. The Sky Garden will be located on the top three floors of 20 Fenchurch Street, which is currently being developed, and will be operated by food experience company Rhubarb. There will be four designated events spaces allowing organisers to hire the entire Sky Garden for private events. The space will be able to host a total capacity of 540 people and room sizes will vary between 20 in the boardroom and approximately 250 guests on level 35. Level 35 of the Sky Garden will have a champagne and food bar, offering an all day food service, while level 36 will house the Darwin Brasserie offering international cuisine. The Fenchurch Seafood Bar & Grill will be located on the top floor of the venue.